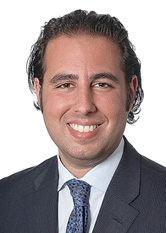 Jared counsels institutional investors, REITs, real estate operators, developers and financial institutions in all aspects of commercial real estate law. He has experience representing clients in connection with real estate acquisitions and dispositions and represents both borrowers and lenders on mortgage loans, mezzanine loans and construction loans. Represented an institutional investor in the acquisition and financing of a $206,000,000 multi-family portfolio in the Houston metro area and a $135,000,000 multi-family portfolio in the Indianapolis metro area. Represented the purchaser of a $225,000,000 shopping mall in San Jose, CA. Represented the preferred equity investor in the acquisition and financing of a $108,000,000 office park in Durham, NC. Represented a real estate investment firm in closing numerous land acquisitions and construction loans for the development of several speculative and build-to-suit warehouses across the U.S. Represented the lender on a $65,600,000 mortgage loan secured by a multi-family property. Represented the lender on a $30,000,000 mezzanine loan related to the recapitalization of an industrial portfolio. While attending Brooklyn Law School, Mr. Rosen was an Articles Editor of the Journal of Corporate, Financial and Commercial Law.